Two crewmen of the Apollo 13 lunar landing mission simulate lunar surface extravehicular activity during traiing exercises in the Kennedy Space Center's Flight Crew Traiing building. Astronaut Fred W. Haise Jr. (on left), lunar module pilot, simulates fueling a Radioisotope Thermoelectric Generator (RTG) of the Apollo Lunar Surface Experiments Package (ALSEP). 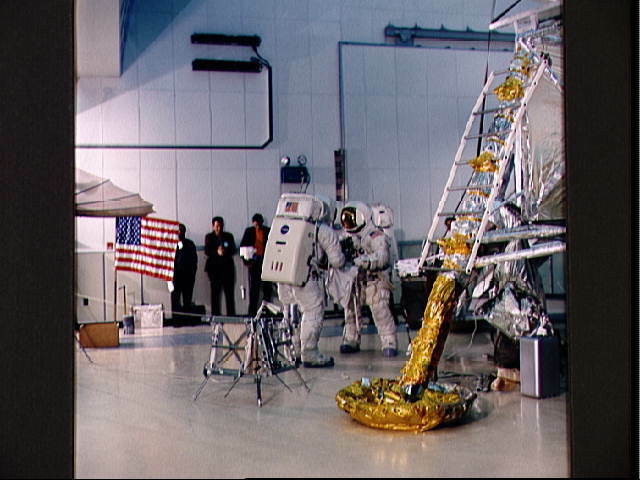 Astronaut James A. Lovell Jr., commander, assists Haise with this EVA task (27036); Lovell, wearing an EMU, simulates lunar surface EVA. He is holding an Apollo Lunar Hand Tool (a set of tongs) in his left hand. A gnomon is in front of his right foot. A tool carrier is in the right background (27037); Astronauts Lovell and Haise simulate lunar surface extravehicular activity (27038).